The first thing that comes to mind when you think about Dubai is money. Everyone tends to think that the city built from scratch in the middle of the desert in the United Arab Emirates must be expensive to live in and to visit. Is Dubai really expensive to visit? I hate when I’m unable to do an activity I want to do when I’m already at a location. So before organizing my trips to Dubai I was concerned about the potential financial burden it could be. But after my trip, I realized I couldn’t have been more wrong! Dubai turned out to be more than affordable for anyone. First of all, unlike most Asian countries, a visa to Dubai is completely free for most nationalities. Whether it’s just a layover, or you’re planning to spend your entire vacation there. You can organize everything at the airport without any hassle. If you have a layover in Dubai, don’t worry about taking your luggage with you as you explore the city because, at the airport, storage is secure and cheap. The luggage deposit price is 20 AED (around $5) for every 12h, less than half of what you would pay at Singapore’s Changi Airport for example. 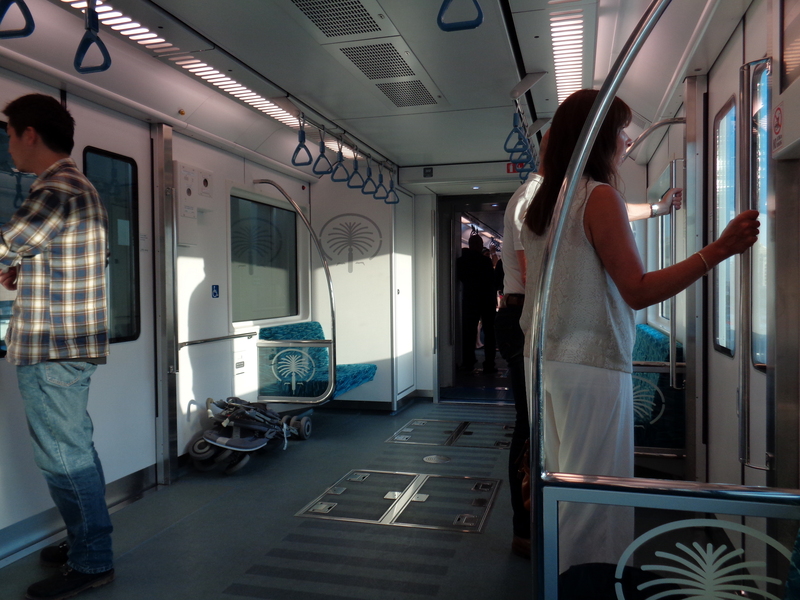 The Dubai Metro is very cheap and definitely worth taking. For about 8 AED I got from the airport to the Dubai Mall in the city center in an air-conditioned, clean, and modern train. Compared to the standards of trains in some alpha world cities such as Paris or New York, Dubai’s metro was not only cheaper but more luxurious. Fares start at 2 AED for an adult, and the most you will pay is 6.50 for all five zones. If you’re really on a budget, you can also use trams for approximately 3 AED per ride, but I wouldn’t recommend them as they’re extremely slow. Suppose you’d like to go to a location that isn’t serviced by metro? The best example would the world famous Palm Jumeirah, an artificial peninsula constructed in the shape of a palm tree. Both the metro and the trams don’t reach it but there is the option of taking the monorail. A ticket for the monorail costs 16 AED per person one-way. However, if you’re not traveling by yourself it’s way cheaper to simply get a taxi. I’m not surprised there are plenty of taxis in Dubai, as they’re pretty affordable. For a ride longer than 30 minutes I paid 50 AED ($13) – super cheap when you consider how far I went. It’s safer to take them than driving – I’d not want to drive in Dubai. Food and drink prices are varied and depend on what you would like to have. If you’re planning on ordering a salad, then you should expect to pay more than you would for pasta or even steak, simply because vegetables don’t grow in Dubai. Enjoying a frozen cappuccino from Tim Horton’s cost me only 17AED ($4.5), which if I’m not mistaken is even less than in Canada where the chain is originally from. EasyHotel Jebel Ali – EasyHotels are standardized all over the world. They cannot impress or disappoint. Naif View Hotel – Close to everything + free wifi. How to see the best of the most luxurious places? A trip to Dubai isn’t complete without at least a bit of luxury, no matter if you have a bunch of money or not. 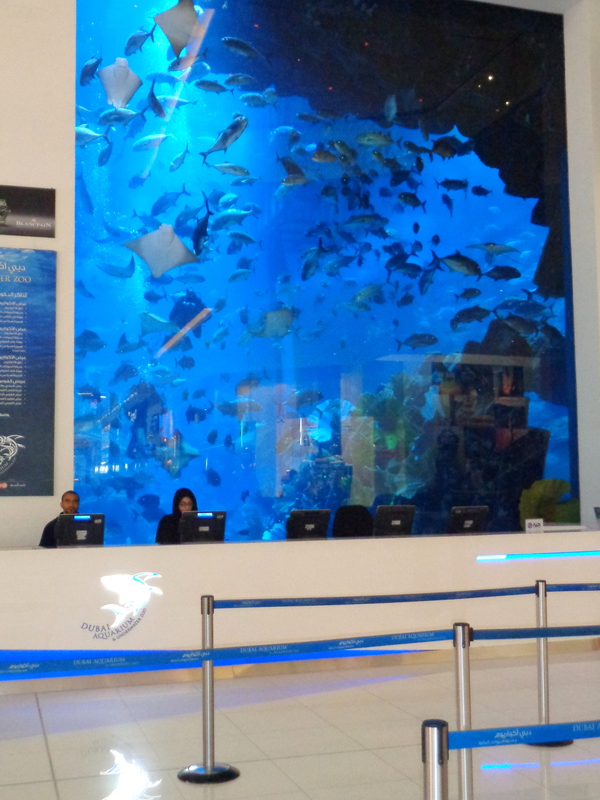 A stroll in Dubai Mall is free of charge and you can still see some really amazing things like the star-filled ceiling and the huge aquarium complete with sharks, manta rays, and an assortment of exotic fish. When it comes to dining out in luxury, the first thing that comes to mind is the Burj Al Arab hotel, the only hotel in the world that has been awarded 7 stars. Don’t even think about dining there unless you are really rich! 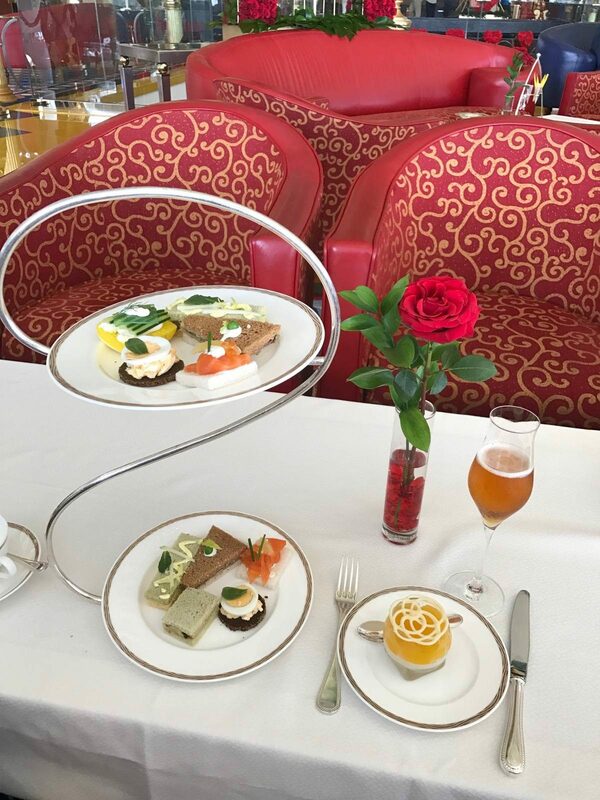 A more affordable option is the ‘Sky High Tea‘ at sunset where you can see stunning views of the man-made islands of The Palm Jumeirah. You have to make a reservation and pay 425 AED ($115) per person in order to access the hotel – security won’t let you in otherwise. If that’s too expensive for you, there is still a way to enjoy the view and the hotel’s light show without spending much money. 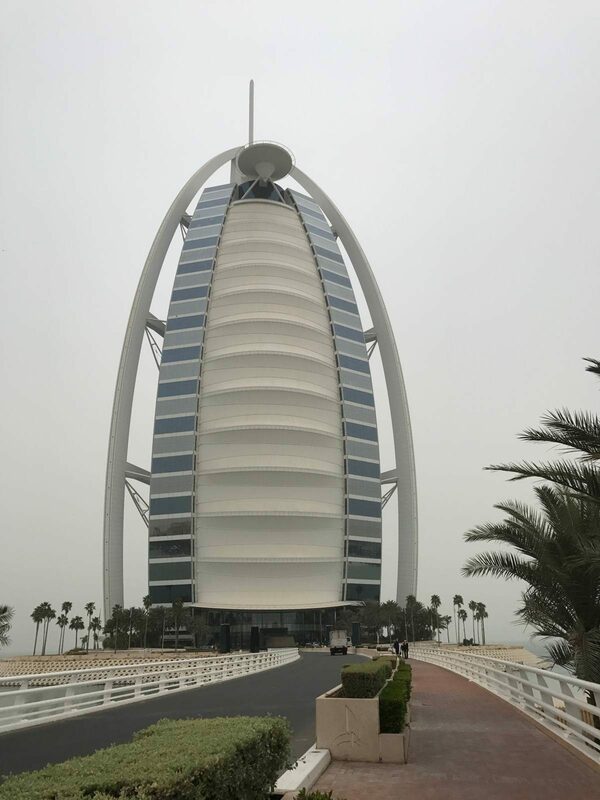 There are plenty of restaurants around the Burj Al Arab Marina, and their prices are a bit more down to earth – approximately 150 AED for the main course. However, if you want to have some alcohol with your meal, it’s going to double your bill as alcohol is never cheap in Dubai. To show you how much I spent in 24 hours during my layover, I broke the costs down below. You can answer your own question is Dubai expensive. Personally, I did everything I wanted to do and didn’t break the bank. TOTAL: 675 AED → 180 USD Not bad for a day of spoiling myself! You can actually save even more now with iVenture Card – something that didn’t exist when I first visited Dubai. It’s a package of attractions that give huge discounts when bought this way. P.S. Trick for saving on water: If you want to save money on water get a LifeStraw Water Bottle. It’s a water bottle with a special filter that will allow you to drink tap water (or even some from the pond, puddle or waterfall) everywhere! Don’t forget to arrange a health insurance before heading to Dubai. The easiest and the most reliable travel insurance is World Nomads Travel Insurance. Get it before your trip to avoid unnecessary troubles that might ruin your holidays! Nice to know that Dubai isn’t off the rails expensive – with a bit of planning, anyone can have a good time in this modern centre of the Middle East! I’m interested to know how it feels like to be inside the Palm Jumeirah as opposed to seeing it from the sky. Does it feel awesome? I feel super strange actually – like being on a normal ground unless you know where you are. It’s also still being built (sort of) so you can see cranes and workers everywhere. Thanks for that post! I’ve always thought that Dubai IS expensive, but the prices you provide here shows something opposite. Yeah, I was there last month and the only thing inexpensive was the taxi fares. Yes, you can eat at the mall food court, but that is not a vacation. Hum, I also thought everything was much more expensive than that! Not bad budgeting I must say. 🙂 You should visit Al Ain and Abu Dhabi next time. Dubai can be as expensive or as cheap as you choose. There are lots of special deals, happy hour, ladies night etc. I recently spent ladies night at The Grand Hyatt, 4 free drinks and 50% off food, with a bottle of water the bill was 70dhs for two. We often visit Ravi restaurant in Satwa – it is not licensed but serves the best tandoori, breads and curry in Dubai, the bill for two is usually around 50 – 60dhs. You can cross the creek on a traditional Abra for 1dh and the creek park charges 5dhs entry. The Dubai Duty Free Tennis is on in March, tickets for the early rounds are 75dhs, the Race to Dubai Golf in November is free, Pakistan are playing their test cricket here, and The Arab Horse a Championships, International showjumping, and a host of other events throughout the year are free. On the other hand you can spend a fortune on drinks and meals, especially in hotels or in the malls, but I just wanted you to know you can do Dubai on the cheap, and that public transport is clean, cheap and safe, taxis are very reasonable but the driving all over Dubai can seem a bit like wacky races if you are not used to it. Have a look at Time Out Dubai website for details of happy ours, ladies nights and events. I would definitely visit Dubai one day. Very interesting – this was a question we were wondering ourselves. We appreciate the price breakdown – super helpful 🙂 Dubai looks like such a fun and exciting place, and it is nice to hear that it may be not as expensive as we had previously thought. Your pics are awesome, as always. Another great post – thanks for posting! I really like Dubai , it’s my dream place that I will go there one day but I still worry about everything in Dubai is expensive becuase Dubai is such a great modern and civilization city so it might !!! But after I read your post I feel like I’m over the moon baca use it’s not like what I’ve been thought so I’ll definetely go there !! Thank for ur post it let me know a lot !! Dubai is expensive or equivalent to UK. Hotel room mini bar crisps 22 UAE currency which isaround £4.10!!!! LOL I could have bought 4 multiplies bags back home. Yes I totally understand mini bars are expensive but not so much that you would dare use it. We went to Emirates Mall the food there was standard British price for 2 adults and 2 children. I personally don’t think it’s cheap. If you can proper planning and manage then sure Dubai is not expensive. Metro and hire car is a cheap option for Dubai trip.